Chris has sent this picture of the collectors set of Robins from Trafalgar Square. If you zoom in, you can see that the grey printing ROYAL MAIL in the background shows MA12 just above the 'g' of the weight. So when this is repeated next year, it will be interesting to see which offices didn't use all their 2012 allocation! Post Office will undoubtedly say that it is for stock control but sceptics (and cynics) will say that it is so that the collector will buy them again next year. Sceptic? Cynic? Realist! I have taken a deep breath and decided that these machine-vended labels comprise a pre-printed 'stamp' - in this case a picture of a robin - and a custom overprint. Since the permutations of custom overprints is very large, it is impractical to collect them all. So I shalln't. Similarly, the RM 'security' scam can't be seen from three feet (not with my eyesight, anyway), so I'm ignoring that as well. 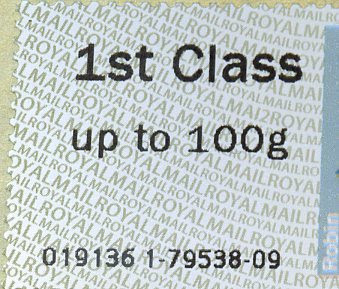 I am content to have a stamp with a robin on it, bought for the lowest possible price (in this case '1st class up to 100g'), and preferably from a PO within reach that does not incur parking charges (which in my case I cannot find). Who has not yet worked out how not to be 'Anonymous'. I agree with you in principle, John. I suggested to collectors that a single 1st class stamp for each local overprint (or even just the first - Perth - one) was the minimum but could also be the maximum you need. The MA12 indicator is in the same style as that on the security Machins, which are of course much sought after. At the right-hand end of the block that reads 'Anonymous' is an arrow which should give you a drop-down menu. You can then enter a name, a pseudonym, or if you are already registered with google for mail etc, sign in with your google ID. Thanks, Ian, my signature is hopefully sorted now. 1. Very little post I get has stamps on the envelopes. This indicates that RM's revenue from the intended use of postage stamps is small compared with other means of paying for postage, and therefore not worth the expense of protecting that revenue by applying ever more elaborate 'security' features. 2. Very little of the stamped post I get is franked. This flies in the face of the 'prevention of reuse' excuse and is in fact an open invitation for me to recycle the 'mounted mint' stamped envelopes for free. 3. RM claims that 'source codes' allow them to review 'operational difficulties'. I will be amazed if they have a technology that can analyse which stamps are from counter sheets, business sheets, rolls or books of various quantities. And, in any case, the time to review operational performance is before the stamps are deployed, not afterwards. So, what is the 'security' frenzy really about? I fear it's simply that RM, having realized that their revenue from the postal use of stamps is in terminal decline, has created a purely philatelic monster to gobble up the pennies we freely offer it. As you say, Ian, the security Machin varietals are 'much sought after'. I for one wonder why we have fallen for them. Last para - they didn't create them for us, they didn't even acknowledge them for some time nor want to discuss them. If they were for philatelic sale then Tallents House would sell you each of the variants which they won't. 3. Surely, operational performance can only be monitored in an operational situation? If there are problems with 1st/2nd detection, or aligning to get the postmark in the right place, then the codes could indicate a pattern in the failures. 1. Look on eBay: simple search for 2nd class or 1st class, or unfranked. There are still very many lots of 'mint no gum', or 'mint on paper'. As you know, we all know how to get the stamps off paper easily and with the increased face values time spent on retrieving from kiloware and reselling stamps, sometimes pre-stuck to DL envelopes is obviously worthwhile. YOU may not get much, but all the 'write-in' competitions in glossy mags, and prize-crossword entries have stamps. I've obtained complete sets of various 10 x 1st commemorative sets thus used. The postage stamp is alive and well, and widely used. Thanks for your reply, Ian. I'm afraid the conspiracy theorist in me got out. I'll invest in a larger resolution magnifying glass and join the hunt! .. or realist. derrgghh.. and what fools are parting with their money..
With "They didn't create them for us" I referred to the security Machins, as I think that was what the previous writer was referring to. And I maintain that that was true at least originally. However, the codes on the Robins Faststamps seem quite unnecessary, and I'm not too sure about the local overprints either! 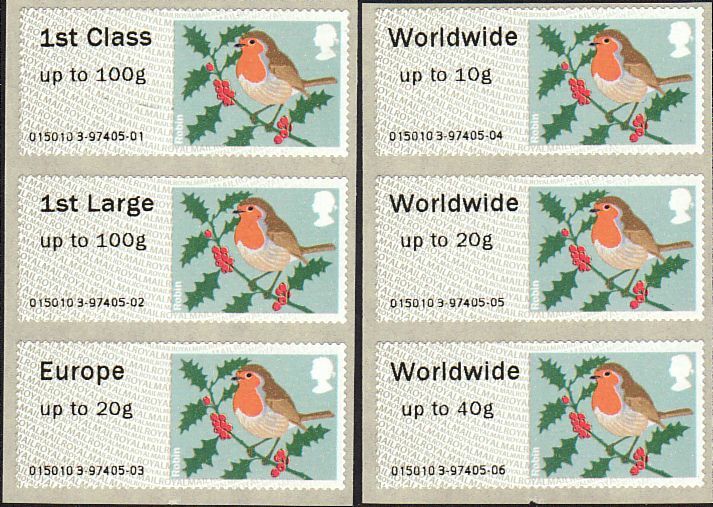 Like the Hytec-printed versions of the Faststamps at Stampex and Perth, Royal Mail do not regard this as a new issue, the robin design having previously been in Birds 1. And of course it is only available at Post and Go PO branches. The 2012 Madonna and Child issue is a continuation of the original. Although there have been several reprints there is no guarantee that you will get supplies from the latest one unless you actually ask for a date block/strip/single. The Notts County sheet is a Commemorative sheet which, like that for the Goons, has been mentioned in the Philatelic Bulletin. But non-distribution of the Poppy stamps is, to my mind, unforgiveable! But it is almost as frustrating for dealers as it is for collectors, as we have to guess what collectors will be asking for next May to fill their preprinted album supplements! I won't get further into the remit of the Philatelic Bureau and whose needs they are serving! Perhaps though it is time for the one-country album supplement publishers to put their pages out more frequently, quarterly or half-yearly. It would improve their cash-flow (and yours?) and give the rest of us a fighting chance of having all the necessary issues to hand when the pages come out. If we are missing items we are looking to purchase them anything upto 16 months after they have issued which often means sourcing at a premium. Just a thought. Sorry, I understand now about the Notts Co sheet. Until there is a sea change at RM and they actually take on board somebody with the collectors' interests at heart - or at least run their new ideas past somebody who understands the collector - they won't change. Some bureaux make all new reprints available to everybody, that's not how it happens here. Although we get to know about new Machin and Country definitive printings, that is only the ones that get to Edinburgh and, despite assurances, of improvements we know that not everything that leaves Swindon for PO branches also gets into Tallents House. The new poppy should have been part of a regular issue from the bureau; the Madonnas are not different from those previously issued and I would think that the collectors who do NOT want a new pair every year outnumber those who, for some reason, do. As for the albums, whilst I can understand their appeal, nobody should be straight-jacketed by them. There is always room for more, and people should be able to live with gaps where they do not agree with the separate listing.